(Nanowerk News) Ferroelectric thin films have the potential to become the building blocks for electronic memory applications but, as film thicknesses decrease with further miniaturization, surface imperfections can influence device performance. Rajeev Ahluwalia and co-workers at the Institute of High Performance Computing of A*STAR, Singapore, have now shown that even nanoscale modulations of the surface geometry can significantly influence a ferroelectric film’s response to an applied electric field, yielding valuable information for the efficient design of nanotechnological devices based on such materials ("Surface morphology effects on polarization switching in nanoscale ferroelectrics"). Information in portable electronics is typically stored in semiconductor memories, where the information is encoded via the presence or absence of electric charges in transistor-based memory cells. In ferroelectrics, however, information is encoded in the orientation of electric dipoles formed in the material. This orientation is also known as the sign of the electric polarization and can be controlled by an externally applied electric field. According to Ahluwalia, the semiconductor industry’s interest in ferroelectrics for memory applications lies in their prospective fast-operating characteristics as well as their ability to retain data even when powered off. Ahluwalia and co-workers’ theoretical study shows that even small deviations from a perfectly flat surface in a ferroelectric thin film may dramatically change the way its polarization switches sign in an applied electric field (Fig. 1). “The non-planar surface introduces nucleation sites due to an inhomogeneous electric field distribution,” says Ahluwalia. These nucleation sites serve as ‘seeds’ for the formation of domains of reversed polarization that grow with the increase of the absolute value of the electric field until the overall polarization of the film switches sign around the so-called coercive field. The details of the dynamical evolution, or the ‘spreading’, of the domains of reversed polarization, as well as the magnitude of the coercive field, are sensitive to the amplitude and length scale of the surface irregularities. “The surface effect will start playing a role when the amplitude of the roughness starts being comparable to the film thickness,” explains Ahluwalia, which is consistent with the numerical results showing a decrease in the coercive field with increasing amplitude in roughness. Despite the study being performed for material parameters corresponding to barium titanate, Ahluwalia predicts that the qualitative results should apply to many ferroelectric materials. 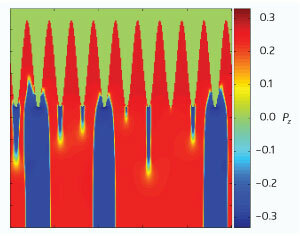 He notes, however, that in the present model the domain dynamics are calculated based on a uniaxial ferroelectric. Further studies based on three-dimensional models are thus required to obtain quantitative predictions for specific device design.